Groove has always been at the heart of the Volca range with their rich array of classic synth tones, they have revolutionised portable music production. Adding to this incredible range is the Korg Volca Kick Analogue Kick Generator. The kick drum is one of the most important parts of dance music production and the Volca Kick delivers without compromise in a unit you can take anywhere. 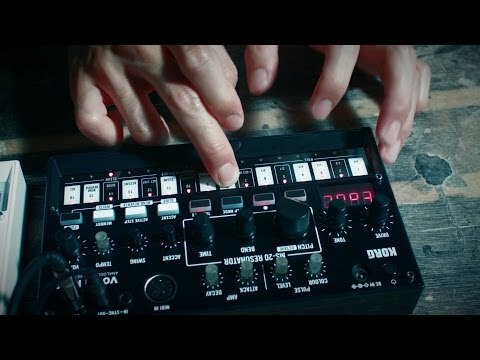 The Korg Volca Kick is capable of generating huge kick tones primarily thanks to its built in MS-20 filter. This works alongside the completely analogue circuit to produce huge resonant tone that can also be used for basslines. The pitch, tone and resonance can be adjusted to create huge, booming swells or punchy tight kicks and everything inbetween. All parameters are laid out on the top panel so that you can get to creating the best kick, bass tones right away without feeling like you have to fight against an interface. Drive, tone, colour, attack and more can all be easily tweaked until you get your favourite "heartbeat". To create dynamic patterns, the Volca Kick features a 16-step sequencer that gives you tons of room for improvisation. Quickly lay out patterns, perform kick and bass phrases and even connect multiple sequence patterns to get up to a huge 256 step song. The motion sequence function lets you add time-varying change to the sound which is a superb way to polish your loops. Once completed, you can save up to 16 of your own sequencer patterns in the Volca Kick for later recall. Thanks to the MIDI and sync connectivity of the Korg Volca Kick Analogue Kick Generator, you can also sync it with other Volca units in the series to create some incredibly complex music just about anywhere. MIDI also means you can use the Volca as part of a DAW set-up to add that classic analogue kick sound to your digital productions. Compact, battery or adapter operated and with it's built in speaker, the Korg Volca Kick Analogue Kick Generator means you can create superior kick tone any time, any place.